Those of us who knew the old Theater teacher know that ever since she left Theater has not been the same since. 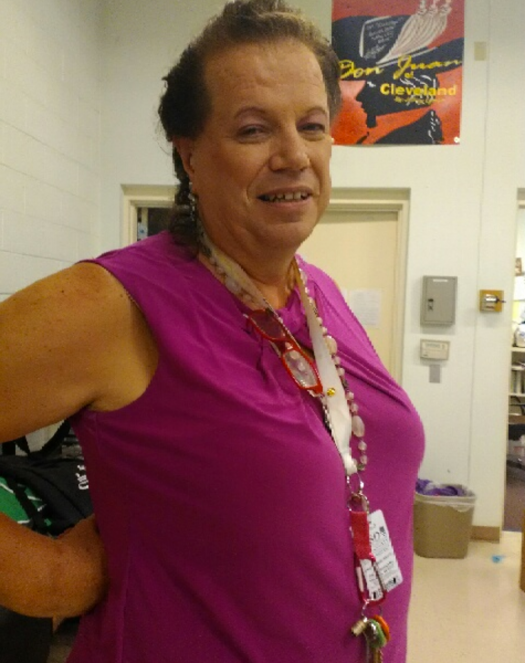 But not longer – meet the newest addition to our school staff, Ms. Pennington! Fresh to the school, she has already begun preparations for this year. When asked how she felt about Clark thus far, she replied with unmatched excitement. “I love it, I think I died and went to teaching heaven.” She discusses her adoration for the students in her class and the administration. It is no secret that the theater program had fallen on tough times for a while, but Ms. Pennington exudes determination and passion when discussing the future she envisions for the Clark theater community. Growth, exceptional levels of production, and diversity are some of her key goals for this year. She’s planning to have a school play later this school year, and to attend the Southern Nevada Leadership/Tech Conference for the Clark theatre officers. Ms. Pennington attended Middleton University in Wisconsin as well as Middle Tennessee State University and received her Masters in Education as well as a minor in theater and music. Her teaching career is quite impressive as well, with 30 years of experience in performances all around the globe, believe it or not. “Japan, Hong Kong, Korea, England, Germany,” she lists off countries, describing many performances and different projects such as lighting, costume design, stage set up, and countless other skills. She has worked on lighting and construction of stages in both old and new schools. With a sense of humor evident to everyone she meets, she talks about going to “5 different second grades” and how her family would “move every time the rent was due”. With a life full of stories to tell, Ms. Pennington will surely create skilled storytellers out of the Clark theater students this year.